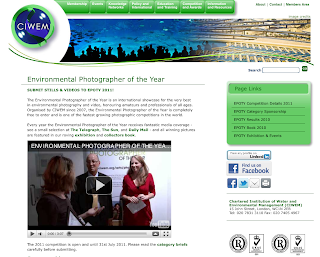 the deadline for the international Environmental Photographer of the Year 2011 competition is approaching fast, so anyone wishing to enter our new video category has until 31st July. As always, the competition is completely free to enter and is open to international amateur and professional photographers of any age, encouraging entries that are contemporary, creative, resonant, original and beautiful. The winning photographs come together to form the most outstanding collection of environmental, social and natural photographs in the world. The new video category is for short film clips of between 5 and 30 seconds on all environmental issues. Copyright is retained by the photographer. For anyone interested in finding out more, or entering their pictures, please go to www.epoty.org.